The CM2043C BLACK+DECKER 40V MAX* Lithium 20 inch Mower is perfect for lawns up to acre. This versatile 20 cordless mower lets you mulch, bag or side-discharge clippings to suit your needs. It comes with two batteries, and youll love how the EDGEMAX design allows you to mow right up to fences and edges. Adjust cutting height with a single lever, and simply fold the handle for compact storage no tools necessary. 163cc 3-in-1 Front Wheel Drive Gas Lawn Mower 21 inch, L2621 The Jonsered L2621 21-inch self-propelled front wheel drive lawn mower delivers superior mulching, bagging, and discharge performance and features the convenience of push-button, electric start. Powered by the 163cc Briggs & Stratton. 675 Series engine with ReadyStart(TM) no prime starting, and equipped with quick height adjustment and high rear wheels, the Jonsered L2621 comes with all the power and convenience you need. 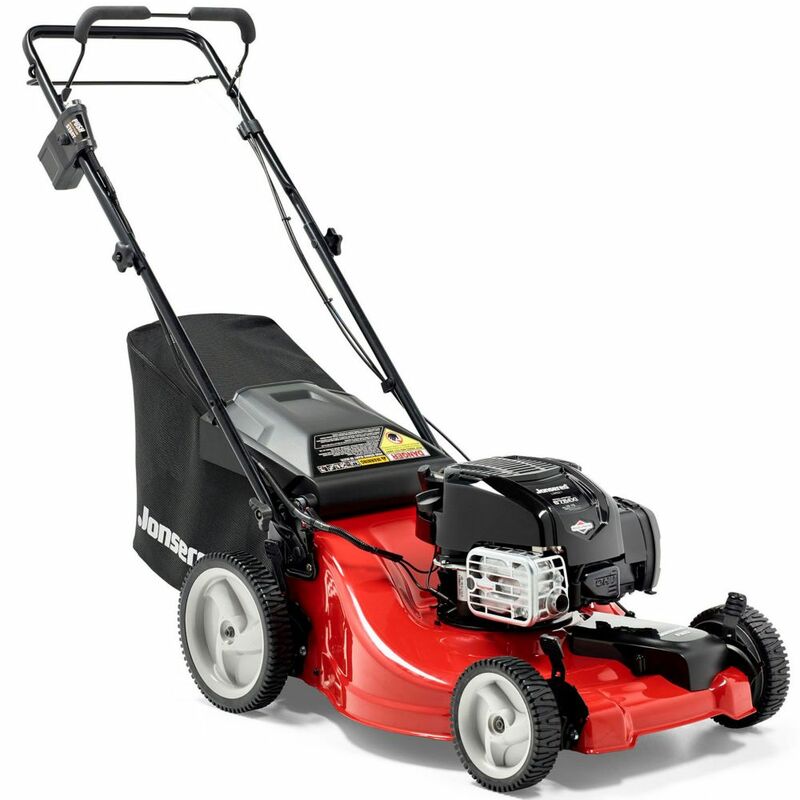 163cc 3-in-1 Front Wheel Drive Gas Lawn Mower 21 inch, L2621 is rated 3.2 out of 5 by 5. Rated 5 out of 5 by Gary from Starts easily and runs like a champ.... Starts easily and runs like a champ. Rated 2 out of 5 by rod from Do not Buy. Electric start is junk on this. I bought one less than a month ago and the battery on... Do not Buy. Electric start is junk on this. I bought one less than a month ago and the battery on the unit is already bad. To make it worse they do not sell just the battery you have to purchase the hole starter housing. I would purchase something else if I had know that something as simple as to replace a battery would be this difficult. Rated 1 out of 5 by WHITEHAT from I bought this mower without finding any reviews, probably because they're new. I only wish they ... I bought this mower without finding any reviews, probably because they're new. I only wish they would let you "test drive" mowers because I would have certainly given this one back. The handle design is awkward and makes your palm hurt and the handle is lower than this picture shows. Low enough to cause me to lean forward and that is a back killer. Maybe if you're an even 5', otherwise NO. Seriously, I'm just going to eat the $370 and buy another mower (MTD) like the one I had previously. Do yourself a favor and stay away from this mower.